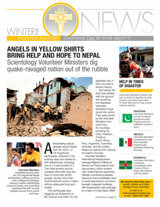 Volunteer Ministers mobilized shortly after the 7.8 magnitude Nepal earthquake, pulling survivors from collapsed buildings, clearing rubble, distributing food and water, and providing "spiritual first-aid" to help people recover from shock and loss. A devastating natural disaster struck Nepal April 25, 2015—a 7.8 magnitude earthquake, followed in the ensuing days and weeks by 304 aftershocks, including one of 7.3 and another 6.7. The initial temblor and its unstable aftermath took the lives of more than 9,000 people, injured more than 23,000 and left some 2 million without adequate food and shelter. The earthquake also triggered an avalanche on Mt. Everest that killed 19, the deadliest day in that mountain’s storied history. But before the dust had settled, with the ground still quivering, the Nepalese Volunteer Ministers Corps raced into action. They were joined by the Volunteer Ministers from more than 20 countries, including Fiji, India, Pakistan, Thailand, South Africa, Peru, Argentina, Colombia, Australia, and the United States as well as from nations throughout Europe. Volunteer Ministers International headquarters arranged flights for Mexico’s famed Los Topos search-and-rescue team, which worked with United Nations-appointed officials coordinating disaster response and immediately went to work searching for survivors beneath collapsed buildings. VM headquarters also arranged for a team of Colombia’s CINAT (National Circle of Aid Technicians) paramedics to fly to Nepal, and for medical doctor Volunteer Ministers from India and Pakistan to bring urgently needed medical care. But the heart of the disaster response was some 2,000 Volunteer Minister-trained Scouts who began clearing roads and removing and identifying bodies within hours of the first earthquake. Nearly everyone in Nepal lost loved ones, homes or property—or all three. Some lost literally everything they had and were traumatized beyond what they could bear. To that end, the Volunteer Ministers offered spiritual assistance by performing Scientology assists for all. Dispatched from the Nepali capital of Kathmandu, the VMs traveled to remote locations not easily reachable in the rubble-strewn nation. With 65 percent of Nepal’s structures destroyed by the quake, refugee camps were erected. But food and water remained in extremely short supply. So vehicles capable of traversing barely passable roads were acquired to distribute food to outlying villages—some of which could be accessed only by equipment trucks pulled by tractors through river beds. Disastrous events in extremely poor and politically paralyzed nations such as Nepal often become an agonizingly drawn-out affair. With the Asian monsoon season just around the corner, the restoration task needed to be undertaken immediately. So while immediate concerns had been addressed, the crisis was not over and the VMs did not leave. They instead embarked on the equally critical recovery phase, rebuilding homes and shelters while also salvaging 24 schools around the country. To ensure their work would continue, the VMs left behind 70 new Volunteer Minister groups, establishing a permanent relief force in the heart of Kathmandu. So it was that the Volunteer Ministers answered the emergency call in Nepal, training more than 7,000 people in VM technology in 124 cities and towns while delivering more than 7,500 Scientology assists and 59,000 meals. They also distributed in excess of 900 tents and provided medical assistance to some 1,200 people. All told, they helped more than 2 million in desperate need and provided more than 420,000 hours of volunteer service. And they asked for nothing in return. 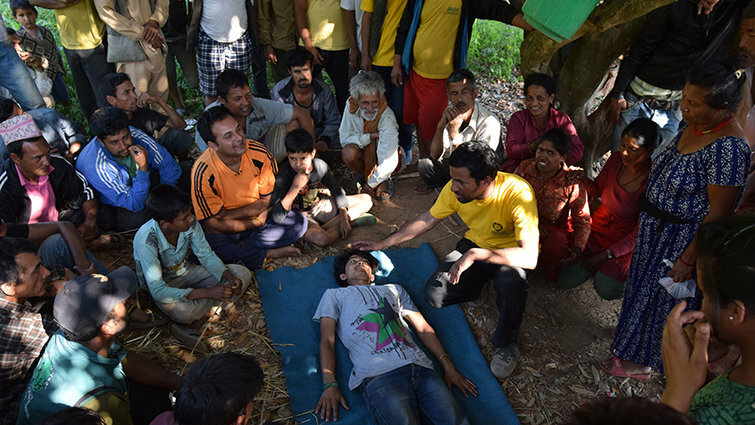 Volunteer Ministers trained local Nepalese on how to deliver Scientology "spiritual first-aid," called assists, simple procedures anyone can learn and apply to help reduce shock and trauma. 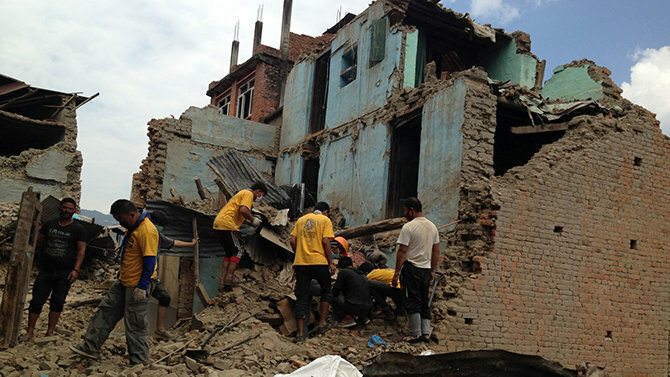 Some 70 VM chapters were formed to continue the rebuilding work in Nepal following the devastating earthquake. Volunteer Ministers are on call at any time to respond to any disaster, natural or man-made, to help those in need. Donations help support the transport of VMs across the world, and provide the vital basic resources for the victims of disasters—food, water, tents and medical supplies.